Christmas decorating is in full swing in our house. I started getting the house 'Christmas ready' about a week ago thinking I'll do it all bit by bit (hoping it will feel like less 'work') but somehow I'm still in the process of decorating a week later. Don't get me wrong, I do enjoy the whole decorating process but the last few months have been crazy busy. I really just want everything ready for the 1st of December now. Anyway, there's one thing that has been missing from our ever-growing collection of Christmas decorations. 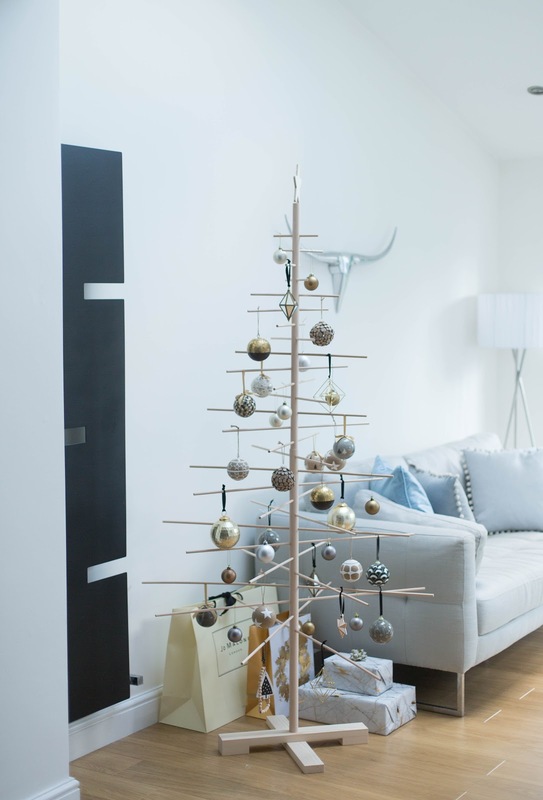 Of course I'm talking about a minimalist style tree (made of wood). 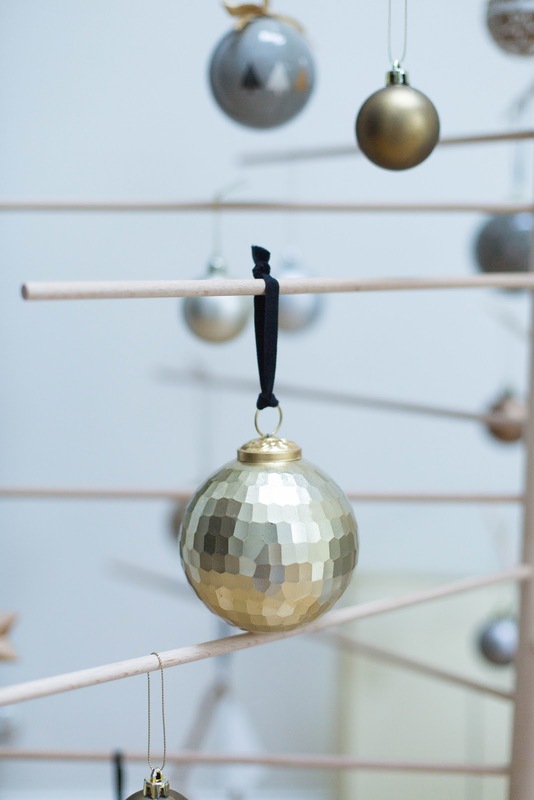 I love the idea of modern Christmas and an eco-friendly Christmas tree that you can use year after year. 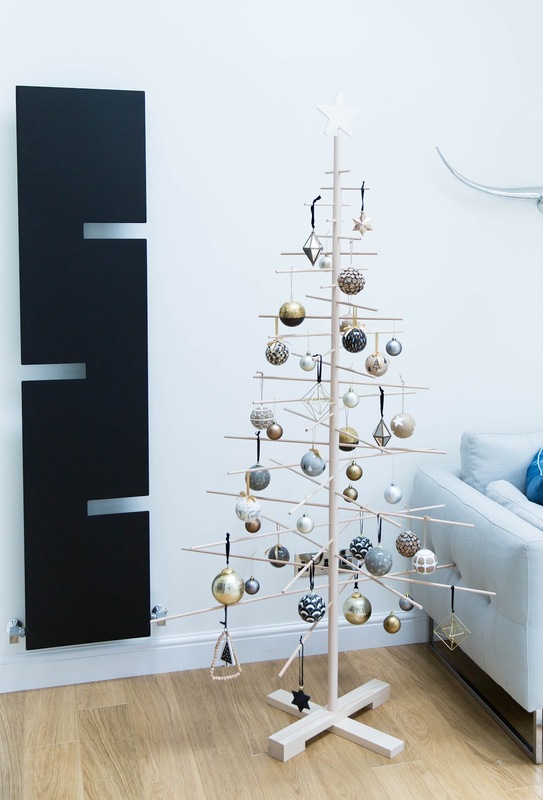 Luckily Cox & Cox came to rescue and sent me this beautiful Scandi tree. As much as I love real Christmas trees, there's just no way I would get 4-5 weeks out of them. I may have also developed a bit of reputation as a serial plant killer, so I'll probably forget to water it too. 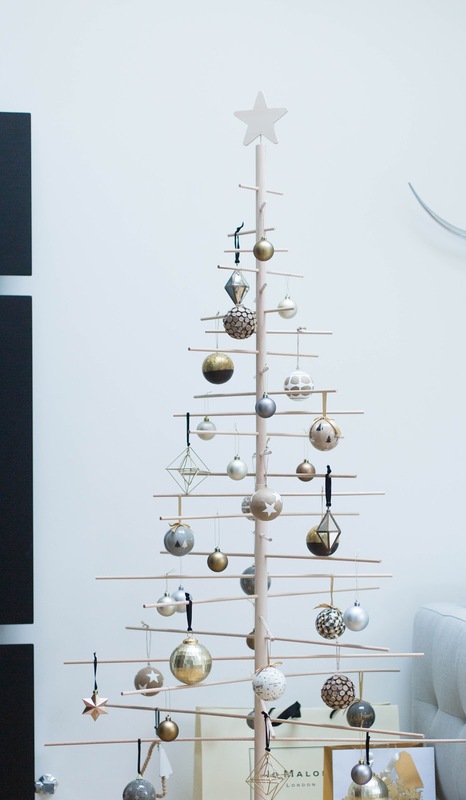 But I'm willing to risk it and my plan is to get a real tree for the living room and keep this minimalist Scandi tree in our lounge. I couldn't have a real tree in this spot anyway, it's too close to the radiator (heat will dry it out). 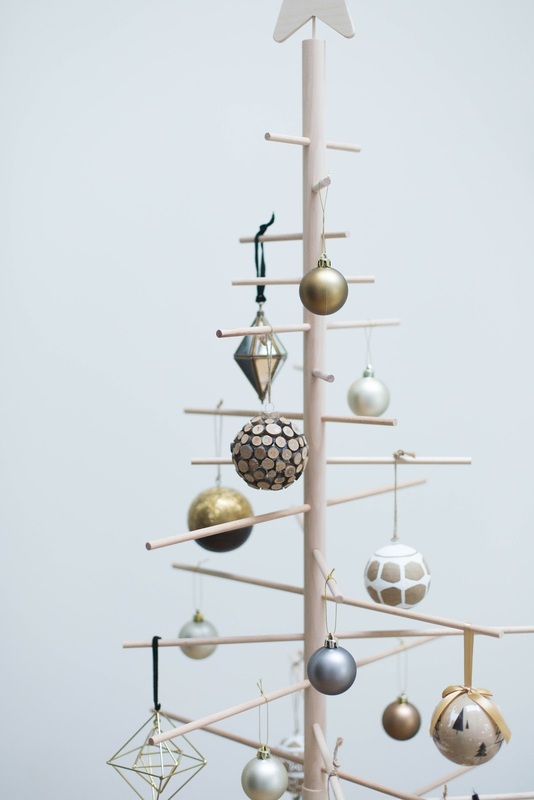 I really feel a minimalist tree like this works so much better in a narrow space. Thanks to the skinny, wooden branches no light is blocked and the room appears just as light and airy as always. I just love it. I'm so pleased it's light wood (spruce), so it matches all my other wood/rustic furniture and accessories. As you can see I went for quite glamorous baubles this time. Most of the baubles are old but there are some new ones out there too. If I'm totally honest, I don't really like decorating the Christmas tree, mainly because I'm slightly obsessed with symmetry and most Christmas trees won't be symmetrical. 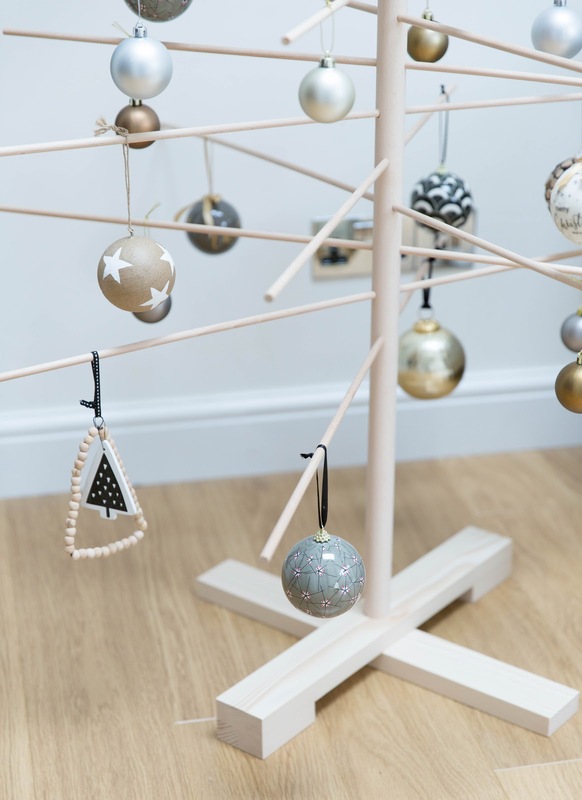 Of course you won't have that problem with a wooden Scandi tree, but I would still think carefully what kind of baubles and style you're going for. I always try to pick different sizes, colours and shapes but also make sure that they have at least one thing in common, ie. colour or texture (it's almost like you're creating a vignette!) I've been rearranging the baubles for the past week or so and I don't know if I'll ever be 100% happy with it, but I do love this tree and I think the glamorous decorations go with it incredibly well. Not so minimalistic after all I guess.. Oh and it wasn't quite as easy to build as I thought it would be. My poor husband had to come to rescue, although this could have something to do with the fact that I didn't read or follow the instructions. So please, do follow the building instructions if you buy this tree as it comes flat packed. The cool thing is it can be rebuilt every year and takes very little room to store. 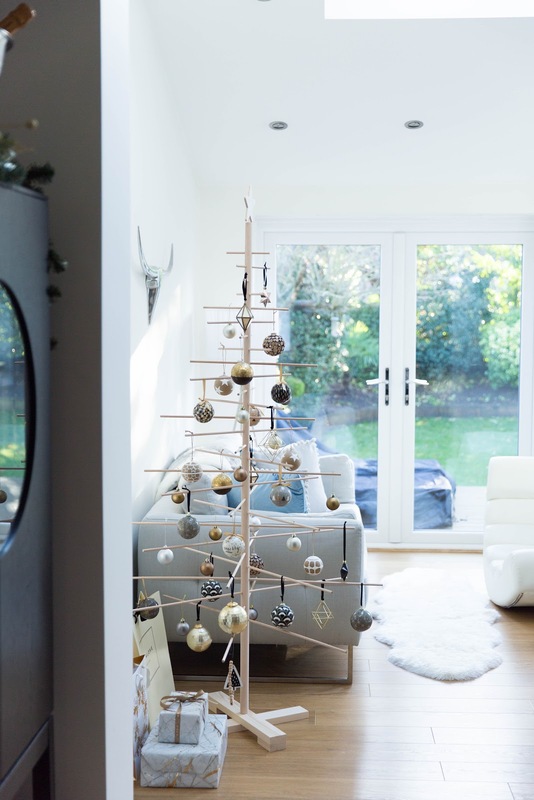 I really hope you've enjoyed my alternative Xmas tree post and that it has inspired you to start decorating the house for Christmas (if you haven't started already that is!) I know there are lots of dos and don'ts when it's comes to the 'perfect' Christmas tree, but I think the most important thing is to have a bit of fun with it and make it your own. Use colours, pattern, your favourite ornaments, or you could even make your own decorations. 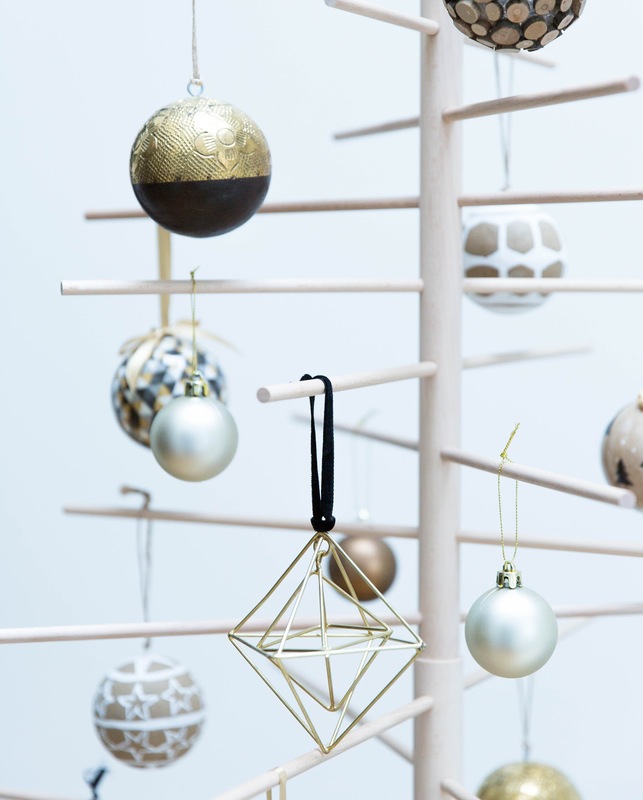 I do think our wooden Scandi tree is ideal for our modern home. I feel that the decorations reflect my style perfectly and it really is a pleasure to look at. *This is a collaborative post with Cox & Cox. I'm a huge fan of trays. I think I've got 10+ trays at the moment, although you can never have too many trays in your home, right? There's no denying that they are practical. 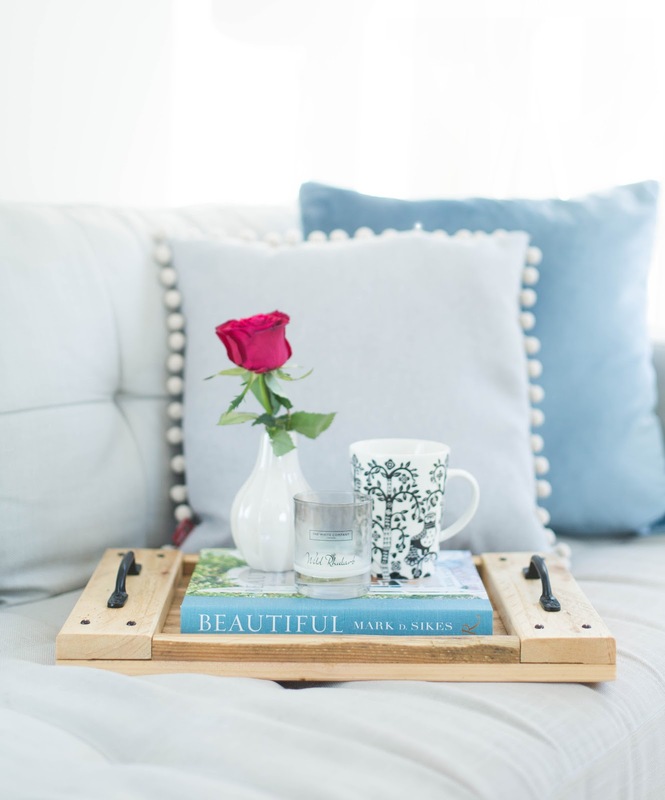 Whether it's to serve breakfast in bed or entertaining dinner guests, trays come in super handy. Of course I try to pick the prettiest ones available too to suit every occasion. 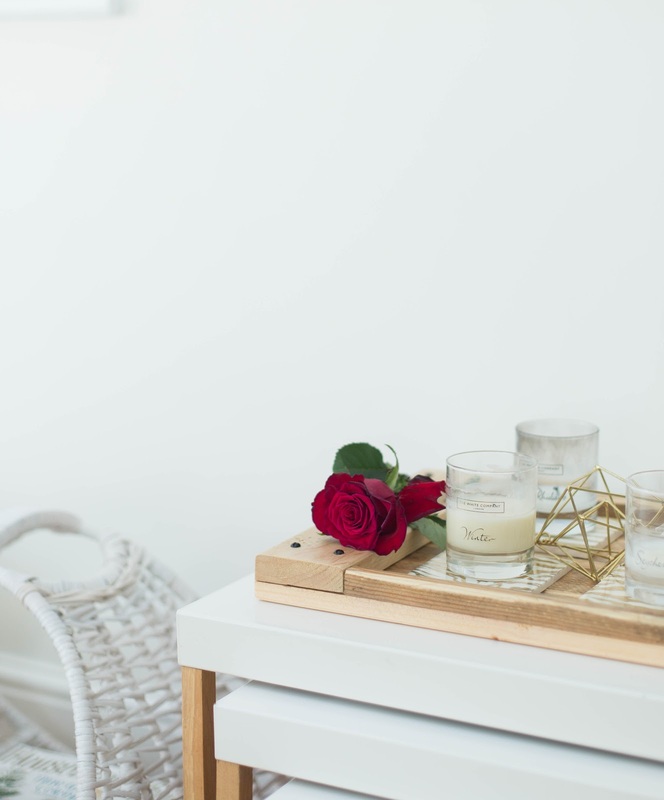 I also love working with small/medium sized businesses, especially if I think my blog readers will love their products. Which is exactly why I'm so excited to introduce you to Vincent Trading. 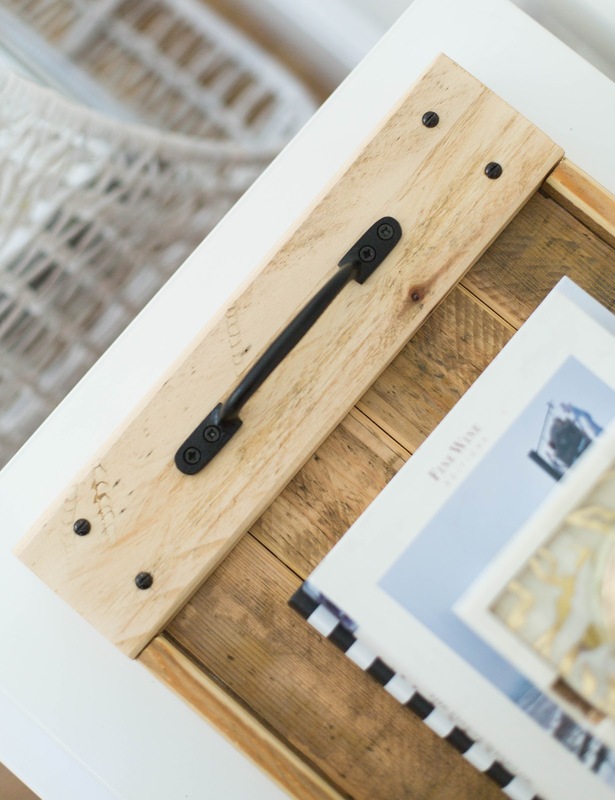 Vincent Trading create handcrafted, reclaimed, sustainably sourced, ethical and eco-friendly products for your home. I love that their aim is to create timeless products; ignoring the fast fashion and saving a few more trees along the way. It's also incredibly adorable that the brand was born in 2016 by husband and wife, Mike and Emma. I've been following their story on Instagram for the last few months and I can honestly say they are very hard working and such lovely people. Their passion for hand crafted wooden furniture is beyond impressive and I really respect that. 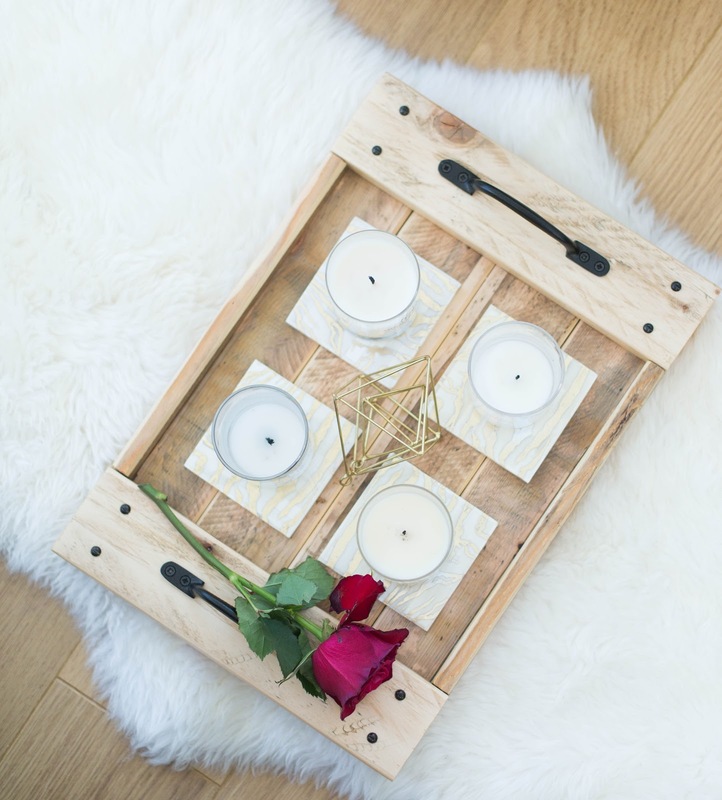 I'm so pleased they also wanted me to review one of their products, especially since I've been eyeing up their signature wooden serving tray for a while now. 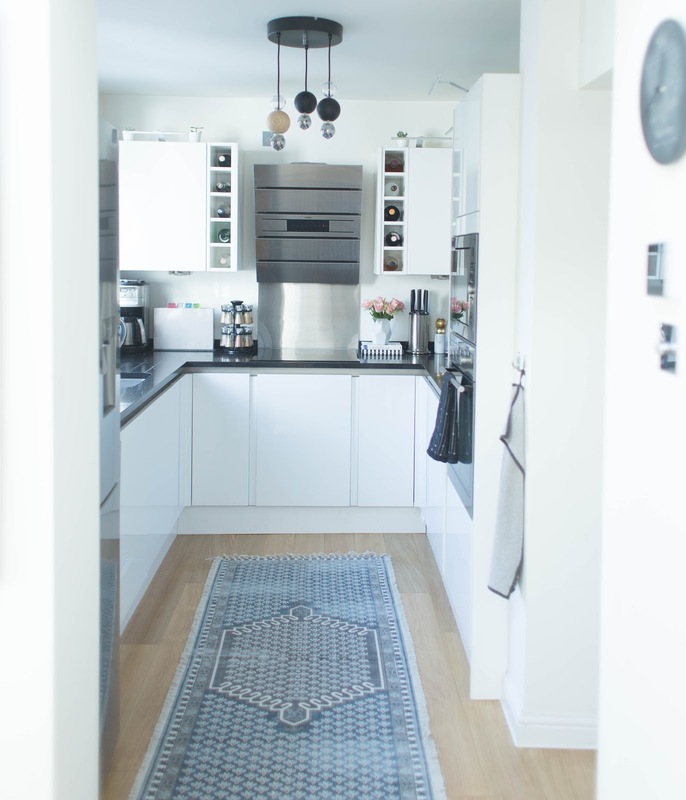 I just love the wooden finish and knew straight away that it would suit our Scandi interior scheme perfectly. Each tray is made from reclaimed pallets. The pallet is taken apart, cleaned, sanded and constructed to this beautiful creation, before finished with a food safe wax oil. 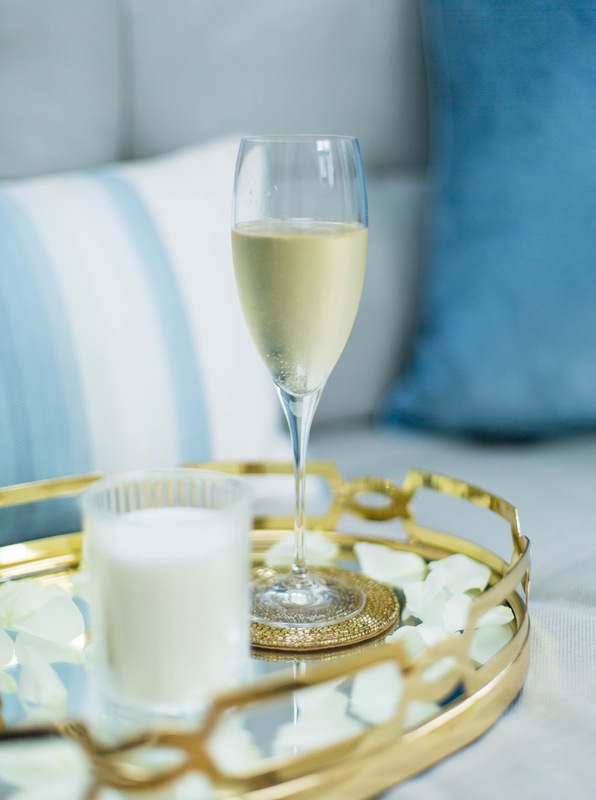 Since each tray is hand made, you can also request a custom size and other bespoke options. How cool is that! What can I say, I love my new tray and it's one of the most versatile trays I own. You could literally style it in hundreds of different ways. I adore the rustic look and the clever metal handles. The quality feels amazing and it's much sturdier than some of the other trays I have. I also love that's it's been hand-made in Devon and the story behind it. All the furniture is made by Mike (who has previously worked as a high end carpenter and joiner). His lovely wife Emma comes up with the designs and ideas. They really do sound like a match made in (wooden furniture) heaven, don't they? You can view their new collection here. I'd love to know which piece is your favourite? * This is a collaborative post with Vincent Trading. 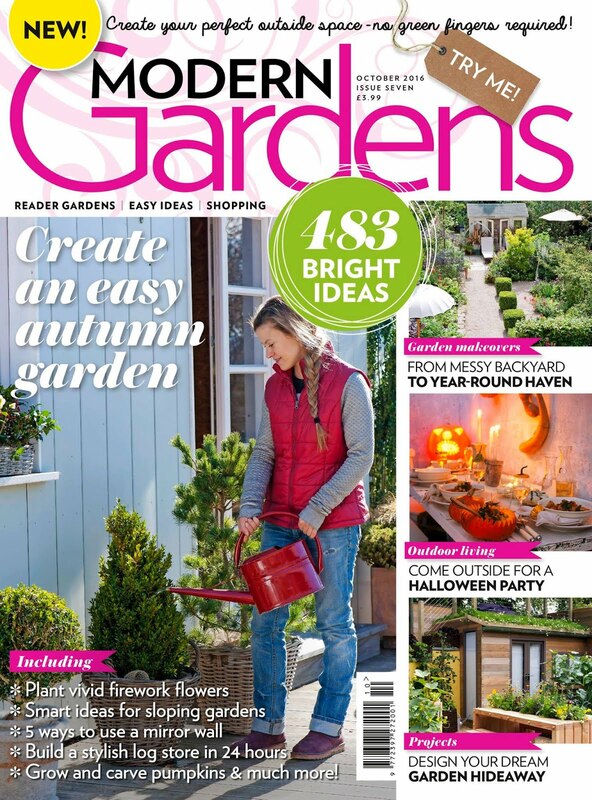 We are now more than half way through November which means the cold weather will be with us before you know it (it has already been so cold some nights we've had to put away all our outdoor furniture). I don't know about you, but a cosy night in is starting to sound a lot better to me than heading out to town. There's nothing better than being snuggled up on the couch with a hot chocolate and some treats, is there? Luckily Hamper Lounge have just what you need for those cold winter nights at home. The 'Cosy Night In' Hamper is ideal for those lazy evenings when you just want to stay indoors and hibernate. 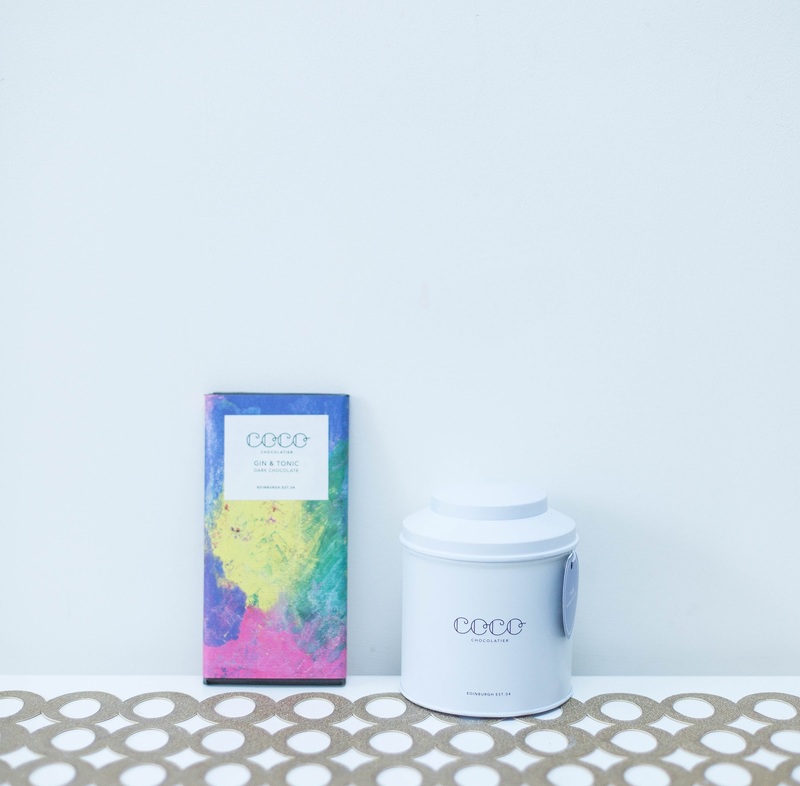 Imagine a luxury hot chocolate in your hand or a glass of very fancy red wine with some delicious biscuits or gin & tonic flavoured Chocolate (which is seriously good, by the way!) Combine that with Netflix and you've got yourself the perfect night in. I know hampers aren't exactly a new invention, but believe me stylish ones are hard to find. Most hampers I've seen seem quite limited (in terms of the products they offer) and they are not filled with high quality items. 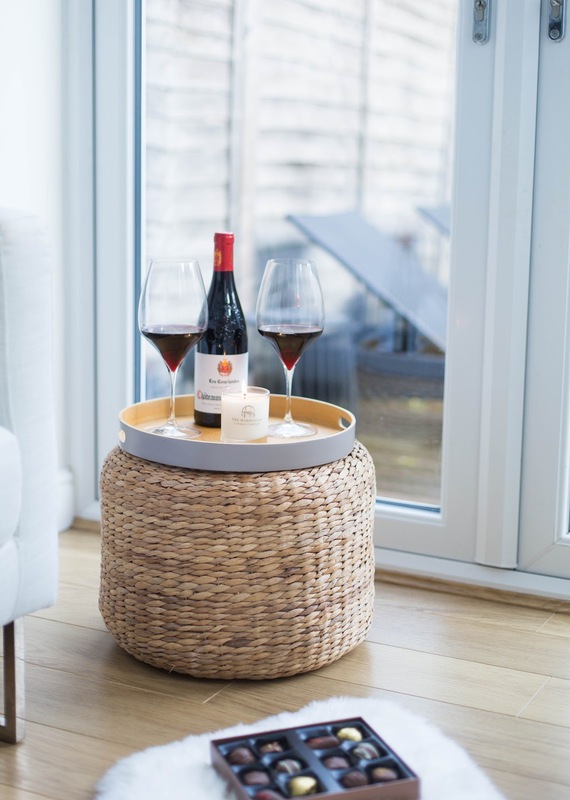 Well, Hamper Lounge have just proved that stylish hampers do exist and you can even design your own if you like. Hamper Lounge sent me this stunning Cosy Night In hamper to be tried and tested. 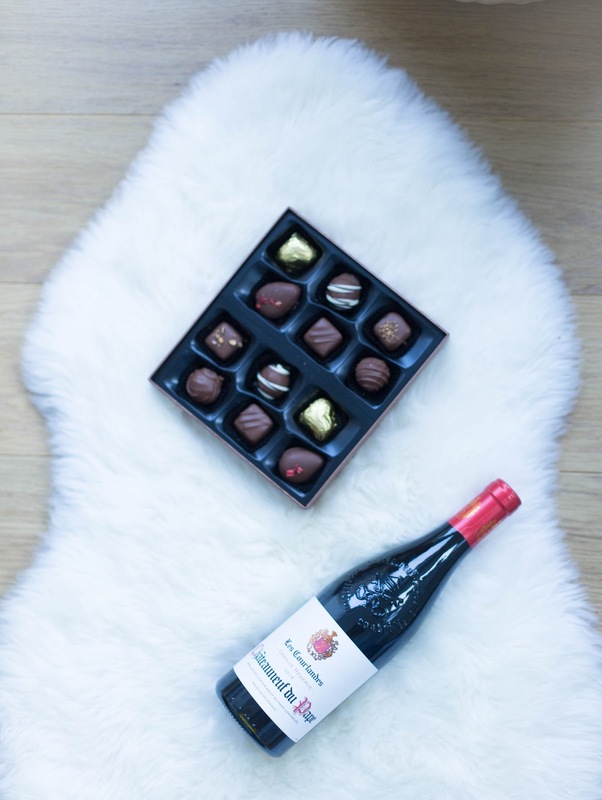 It's a tough job to eat chocolate and drink fine wine, but someone's got to do it right? In all seriousness, I haven't gotten through the entire hamper yet (it's pretty big and will last you weeks, or maybe days if you're chocoholic like me). The chocolate and the cookies didn't last long and I cannot wait to try the port soon with some gingerbread men and blue cheese. By the way, they have lots of gourmet food hampers available too if you like cheese and wine. The best part is that the hampers start from as little as £22 so there is something for everyone. 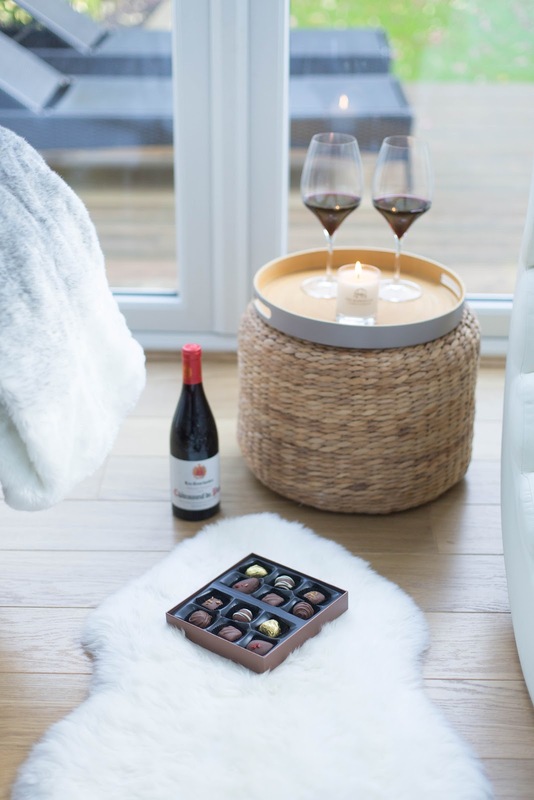 Here's what's inside the 'Cosy Night In' hamper. Remember you can design your own too! 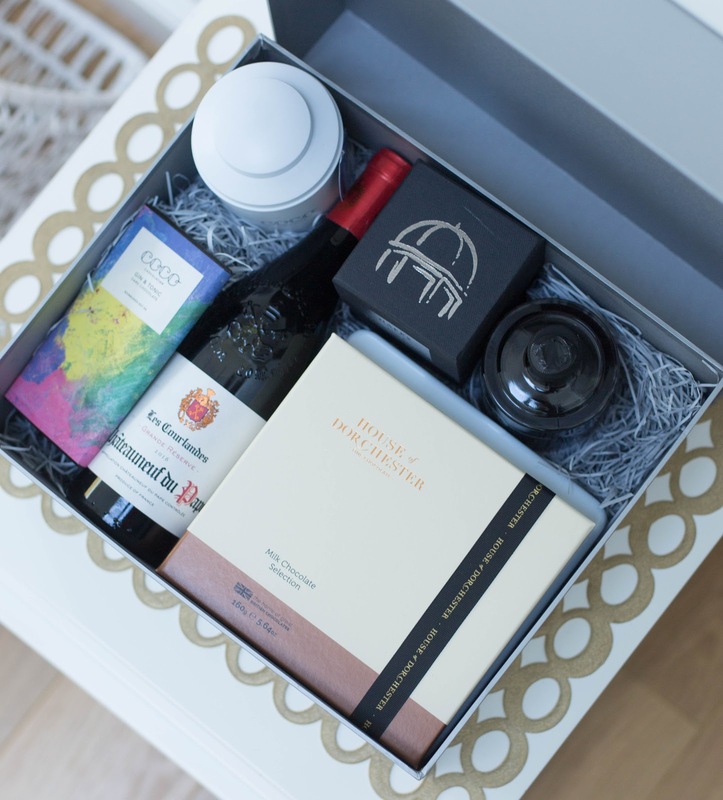 I do think this is the perfect hamper to indulge in in the run up to Christmas. It would also make a great Christmas present for the person that has everything. We all know one or two 'hard to buy people' but I can't imagine anyone not being excited about this hamper. Who doesn't need more chocolate, biscuits and fine wine in their lives? 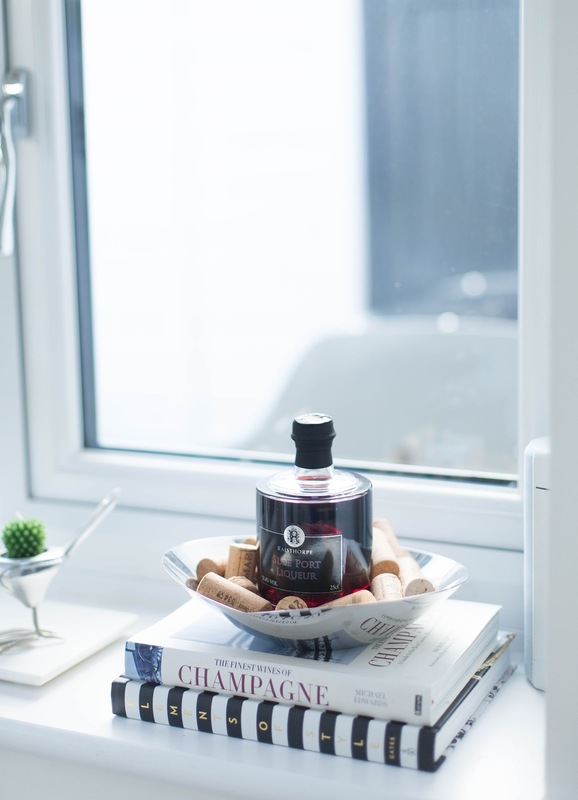 This hamper feels very luxurious thanks to the packaging too and the fact that it's fully customisable makes it really stand out from the crowd. 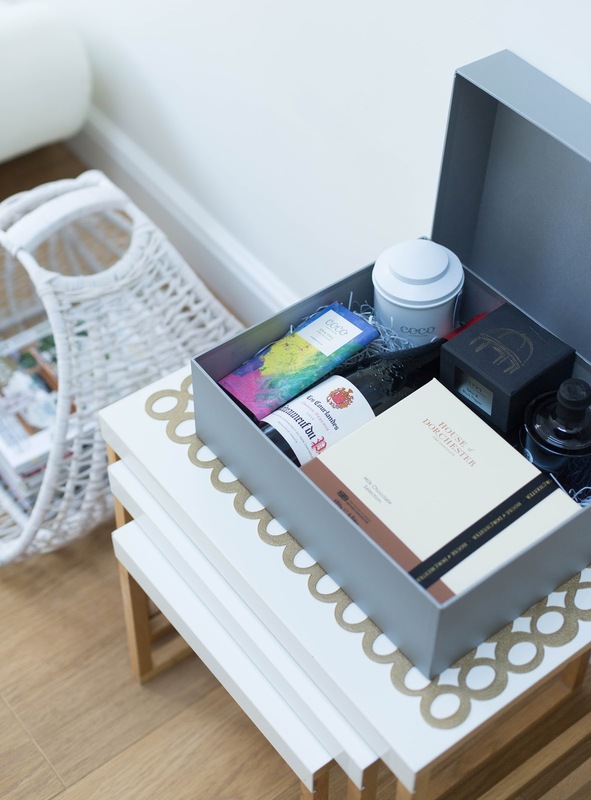 What's inside your ultimate hamper? Chocolate, cheese, wine or maybe bath products? Leave a comment or let me know on Instagram. PS. 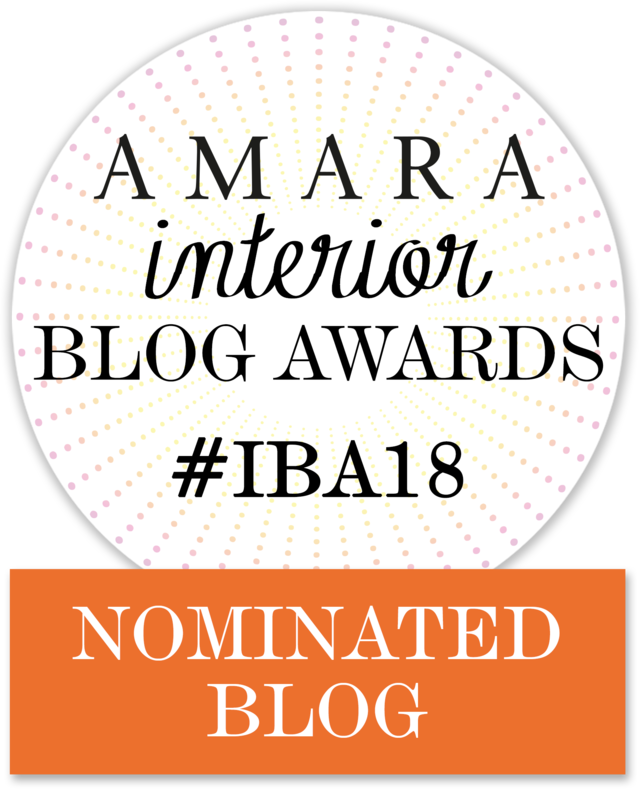 Hamper Lounge are kindly offering a discount for my blog readers. You can get 10% off all hampers by using discount code FD10 at the check out. * This is a collaborative post with Hamper Lounge. Despite having lived half of my life away from Finland, Nordic design is a big part of my heritage. I started collecting Arabia cups when I was only 13 years old (many Finns do that!) and I've always felt extremely proud and supportive of Nordic and especially Finnish design. I guess that's why I couldn't be happier that Nordic design brands are so hot right now. 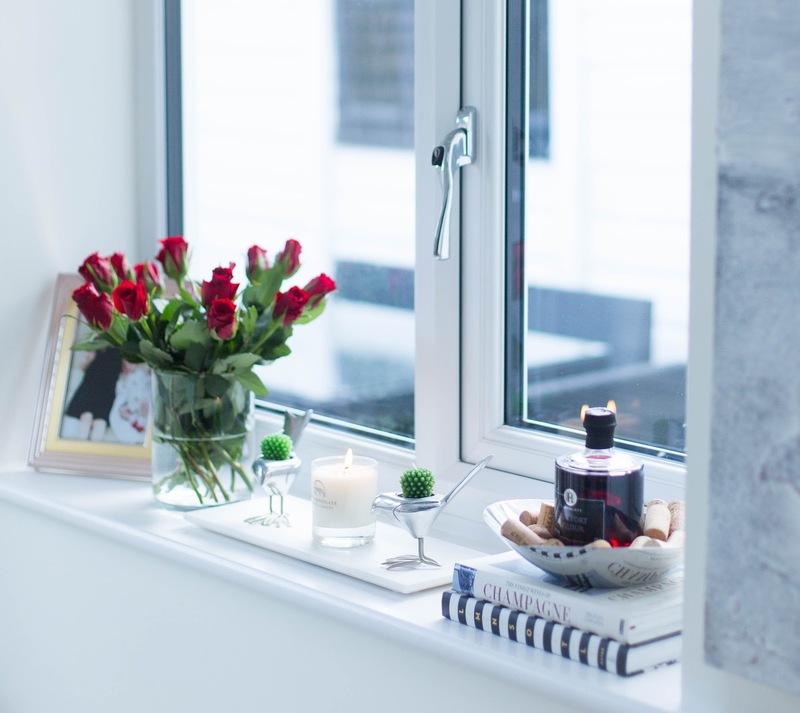 It feels like Nordic/Scandi interiors have taken over the interiors scene here in the UK for quite some time and I really don't see this trend slowing down anytime soon. 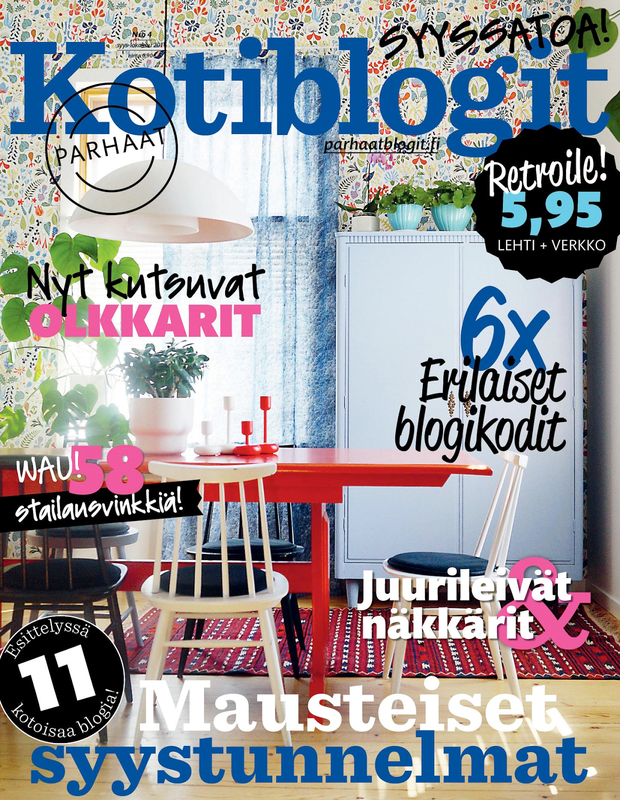 Just google Scandi maximalism and you'll understand why. But, Nordic design is not really about trends. It's about carefully selected, crafted and ethically made design brands that last a lifetime. 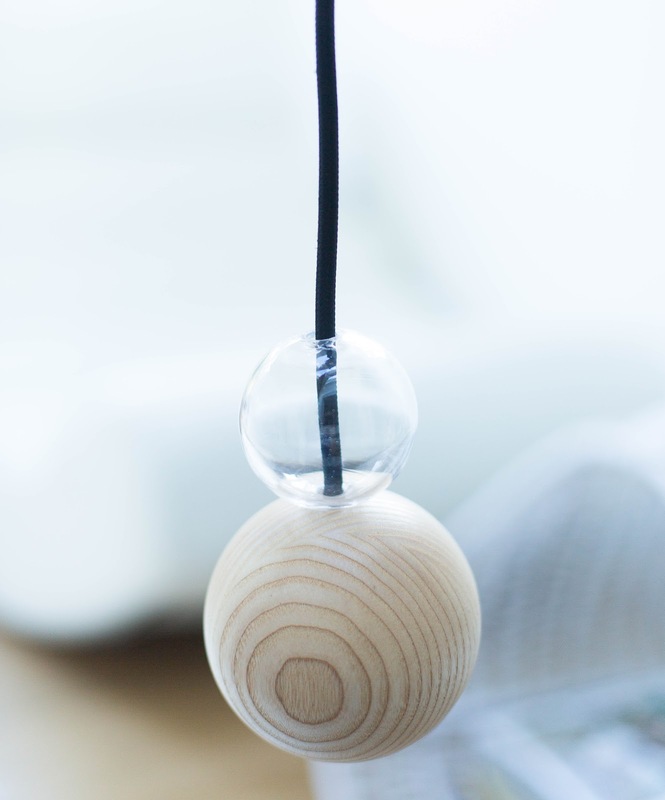 That's also why I (literally) jumped at the opportunity to work with a new Nordic lighting brand Quu Design. From the moment I was introduced to these lamps, I was hooked. I'm not going to lie, the fact that they are made in Finland is pretty cool too. 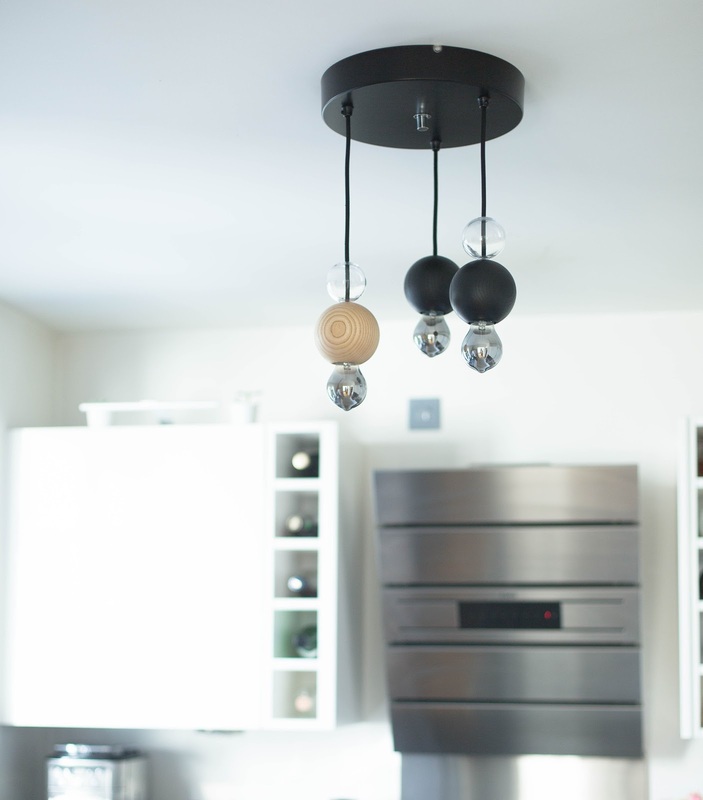 There is something very magical about these lighting pendants. Maybe it's to do with the contrast of sustainably sourced wood and fine glass, I don't know, but they just ooze elegance and simplicity in a very understated way. 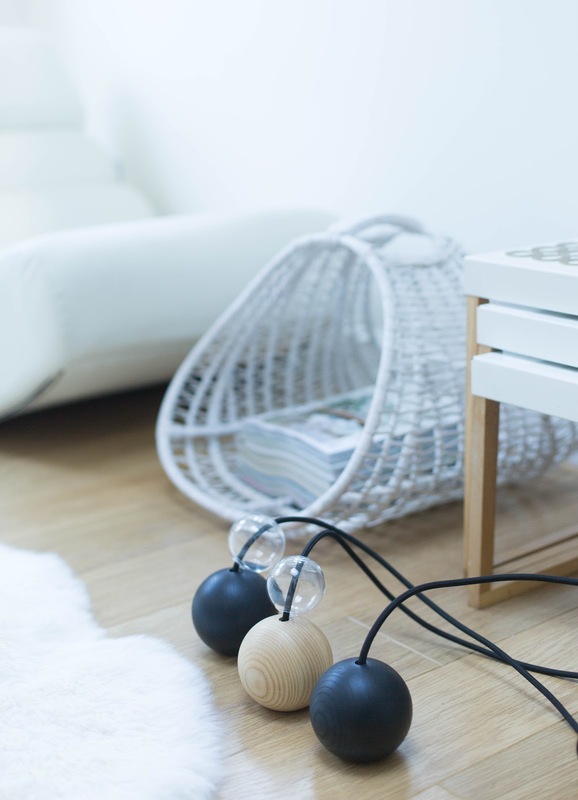 Quu Design was established in 2014 by Heli Mäkiranta, a very talented interior and lighting designer. Heli is an interior designer and she stumbled across these lights almost by accident. She had an opportunity to design her very own lamp for a client and that's how she came up with the design and concept for Quu lamps. 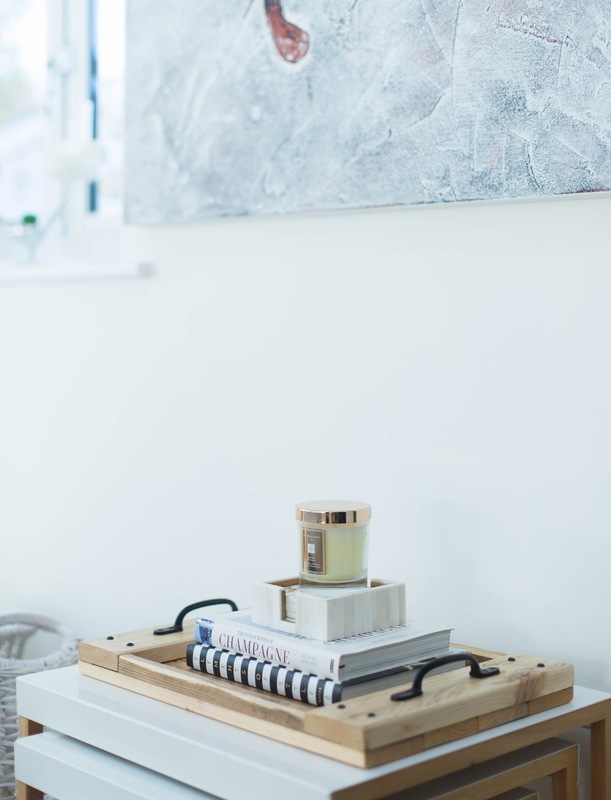 Her unique lamp designs have really taken off since then and she has been featured in many international magazines such as Vogue, House and Garden, Home Etc and many more. 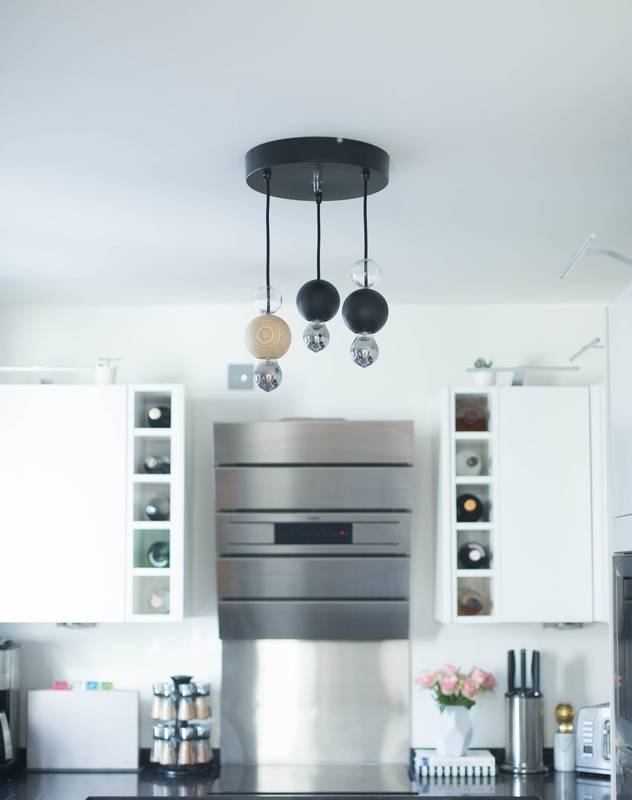 She was also incredibly kind to send me one of her Quu Group S pendants to be installed in our home in exchange for an honest review on the blog. 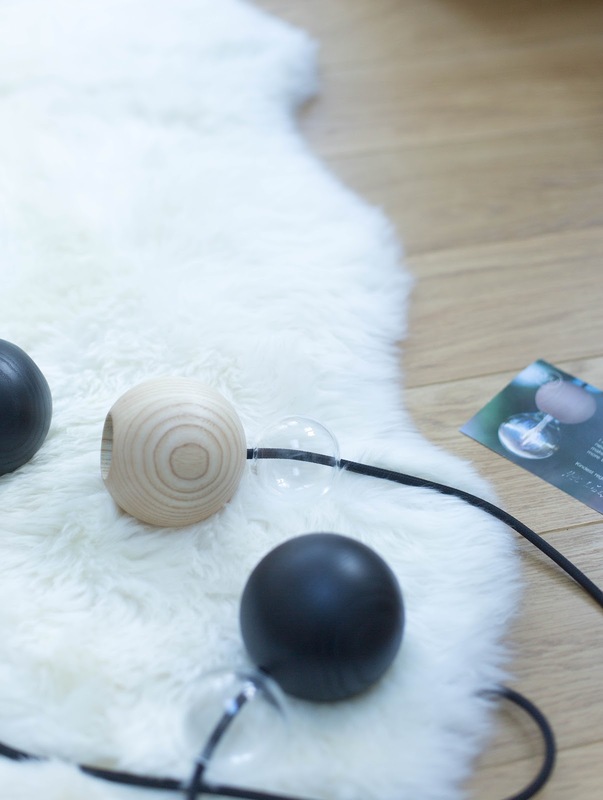 Picking my favourite Quu lamp was a tough call (they are all so pretty!). It didn't help that you can also customise your Quu lamp; you can pick almost any design and colour combination you like. 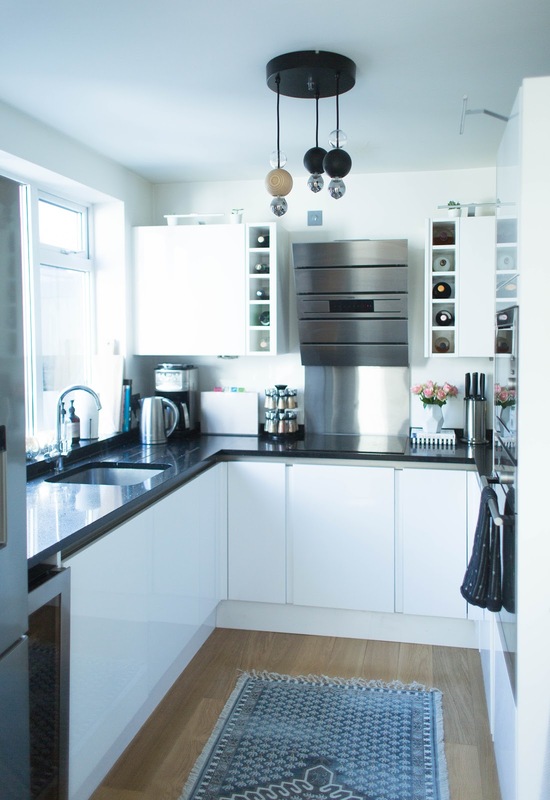 As much as I love the white pendants, I knew that the black lamp was going to stand out more in our monochrome kitchen. Since the lamps are handmade, international deliveries can take a bit longer (4-8 weeks) but oh boy was it worth the wait. My Quu lighting looked amazing when it arrived. The quality is superb (just what I would expect from a Finnish brand) and I'm so glad I went for the ash wood combination. Also, the hand blown glass balls (made of recycled glass) are just stunning. I absolutely love the contrast of wood and glass in this design. I had an electrician to install the lamp and I would recommend you do the same. You need a few hooks to install it, since it can be a little heavy, so please don't attempt to do it yourself unless you're an experienced electrician. The wire is 1.5 meters long which means it's ideal for high ceilings. Unfortunately our 1930s house doesn't have very high ceilings, but luckily Heli had thought of everything when she designed the lamp. You can hide the extra wire in the ceiling rose which is such a genius idea (especially if you ever decide to move it to another room). I love metallic accents, so I decided to pair this lamp with these glamorous metallic light bulbs (their colour temperature is pretty warm so I would only really use them with additional lighting on). White or see through bulbs will go with it just as well. It really depends on the style you're going for. I've always felt our small(ish) kitchen was lacking any real wow factor but now thanks to our new lighting that's certainly not the case anymore. My new Quu lamp isn't 'just' a lamp. It's a feature. A feature that doesn't go unnoticed. 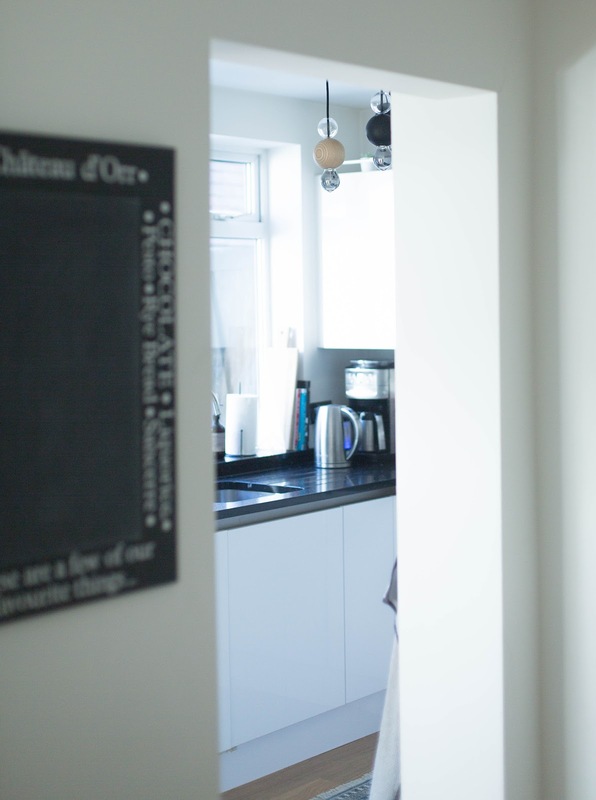 I keep admiring it every time I walk past our kitchen and even my husband has commented on it (which never happens). I can't quite decide if I like it better with the lights on or off. I guess thanks to my decorative bulbs it looks very stylish even when the lights are off. Honestly, I can't think of anything negative to say. I love my Quu lamp so much that I've decided to take it with me if we ever move house. The only thing I'd say is that think carefully where you'll be placing this lamp. Bigger rooms need a bigger pendant (you'll need more light) and smaller rooms less. 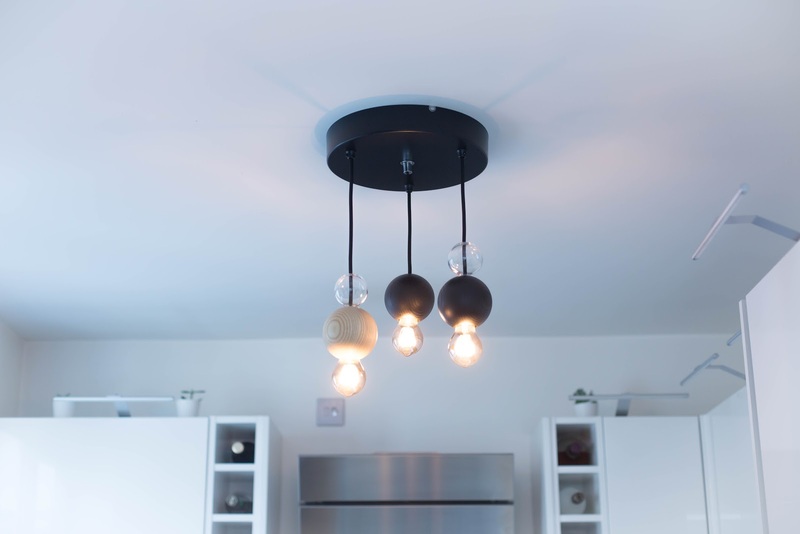 The see-through bulbs produce a strong light so if you want more ambient lighting pick a bulb with low lumens (ideally 100) or consider installing a dimmer switch so you'll have complete control over your lighting. Personally I love this lamp in the kitchen or above the dining room table, or even in the bedroom. 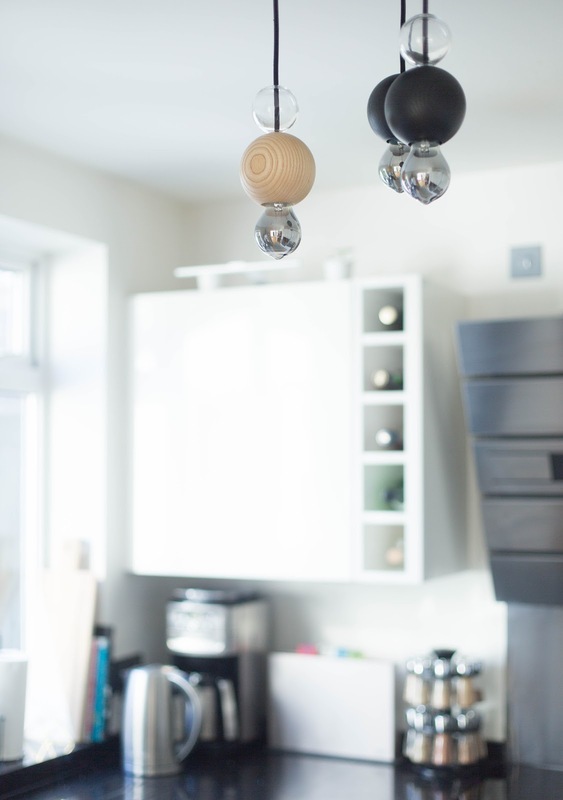 If you need more light around your food preparation area or island it's better to go for the single drop hanging pendants. I guess it's pretty clear I'm very fond of this lamp (for so many different reasons) and it has transformed our kitchen beyond my expectations. There are few different ways you can make a small kitchen shine, but the easiest way is to focus on the accessories. 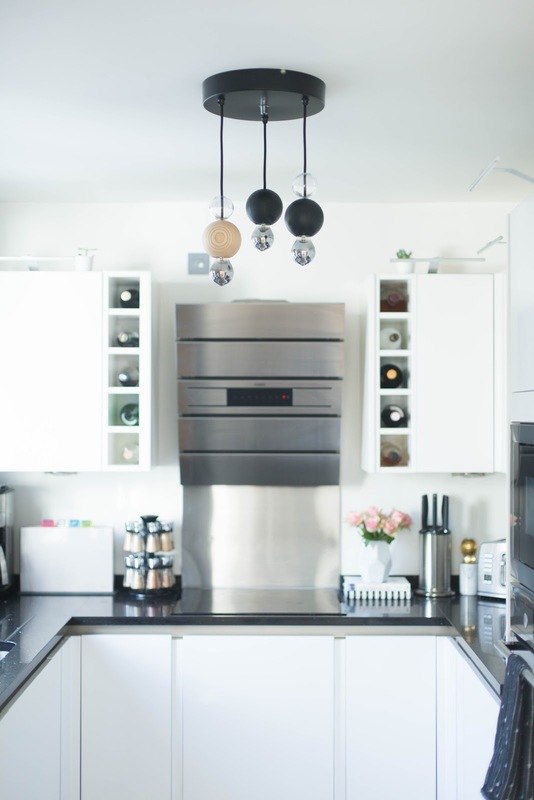 Pick the best appliances and accessories that your budget allows. Don't be shy. Be ready to make a statement. 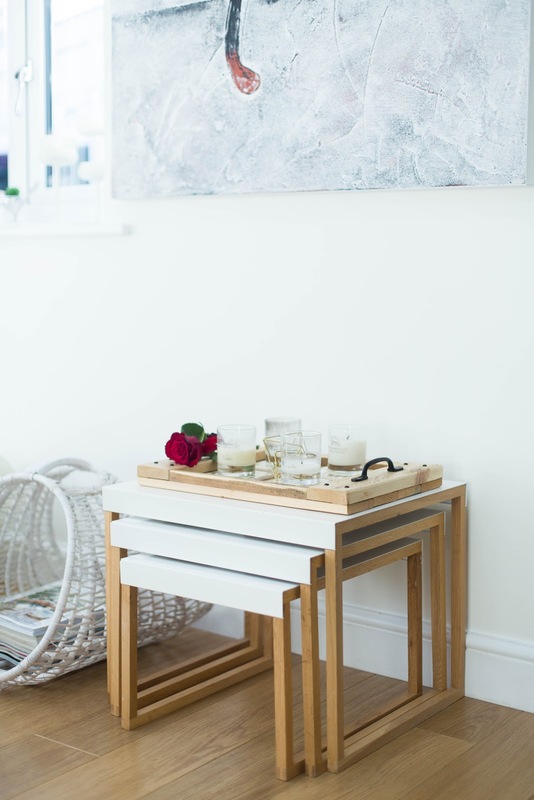 What I love about Nordic design is that it's truly timeless and a real investment. My parents haven't changed some of their furniture for over 40 years and they have never really gone out of style. It's just another proof that Nordic design doesn't date and that's how I know I will love my Quu lamp for many years to come. * This is a collaborative post with Quu Design. As always, I only promote products/brands I feel passionate about. 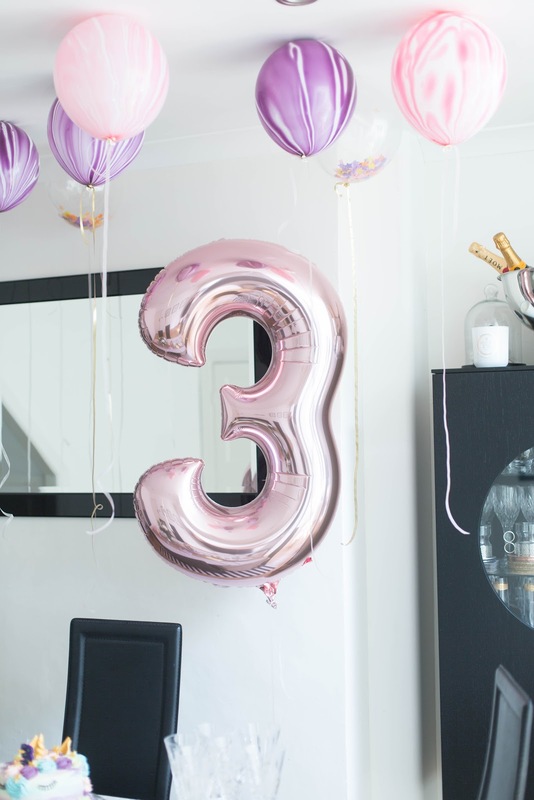 My youngest daughter turned three last month (seriously, where has the time gone? 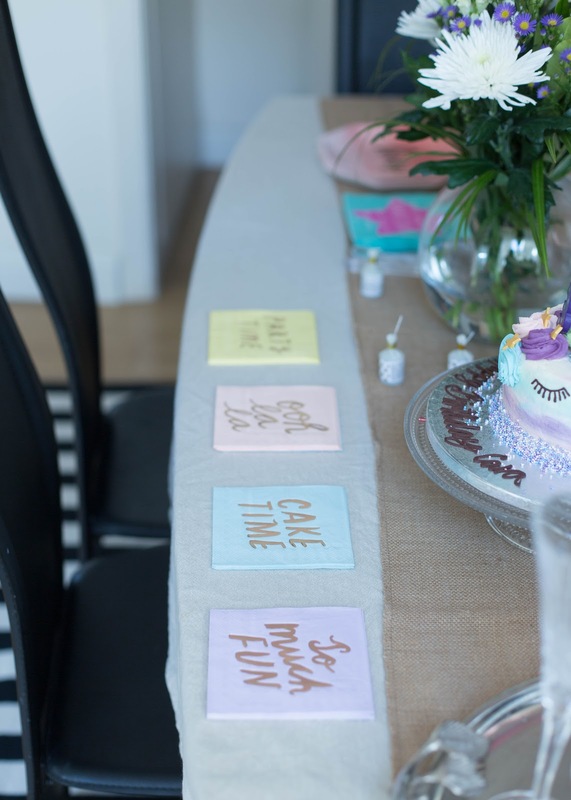 ), so it was the perfect opportunity for me to create the prettiest pastel tablescape. 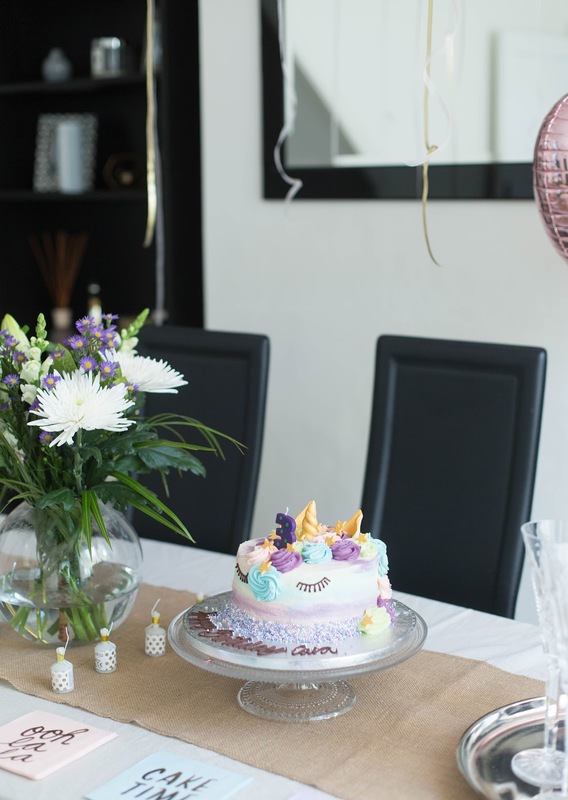 Pink is the obvious choice when it comes to girls birthday parties, but I really wanted to use as many pastel colours as possible in this table setting. I guess I went for a bit more casual look this time. I wanted this tablescape to reflect my daughters personality a little. She is the wild one in the family for sure. She is so much fun, slightly unpredictable at times and the sweetest 3 year old I know. So, let's start with the cake. By the way, I didn't pick a theme this year because my daughters taste changes so quickly. She is obsessed with fairies and unicorns though, so I knew that a unicorn cake would be a safe bet. Our unicorn cake is from Lola's cup cakes and it was a big hit at the party. We went for double chocolate and it was definitely the right choice. It wasn't too sweet and the frosting was delicious. I really loved the design too. It's a kiddie cake but still so stylish. I loved all the detailing and the sprinkles. The colours were very flattering too. If you're looking for a more budget friendly unicorn cake, Saisbury's have a very similar one as well (although it won't be chocolate). 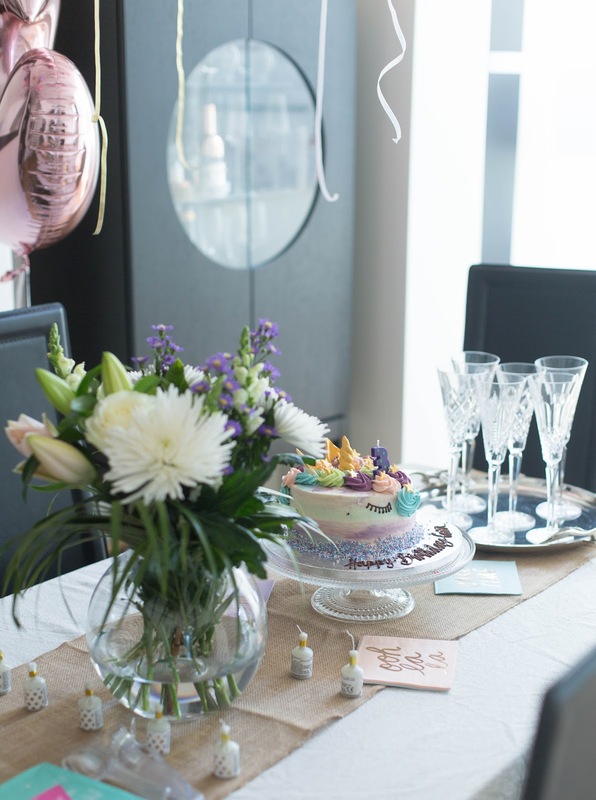 I always use my Iittala Kastehelmi cake stand for birthday parties. It's so versatile and it will suit any table setting. The Hessian table runner (mix of jute and cotton) is from Ocado. I do my weekly shop there and I was so pleased to discover they sell so many party supplies too. 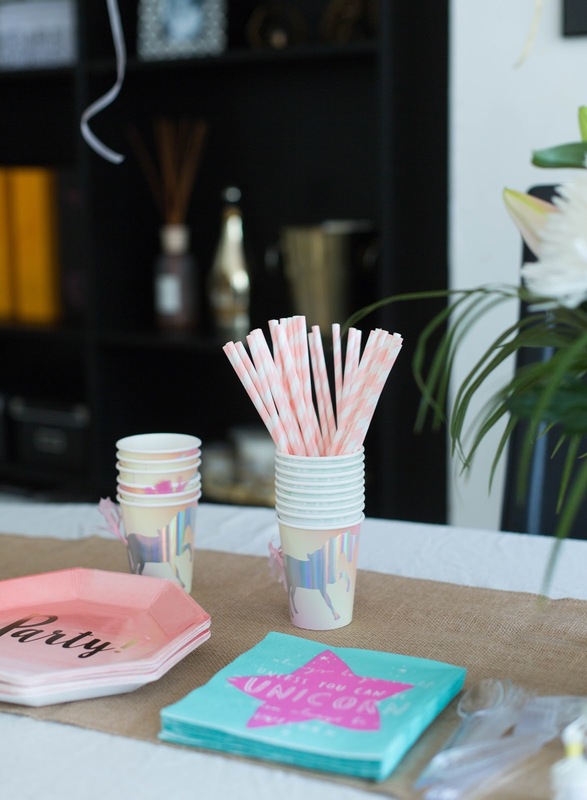 My fabulous pastel party napkins are also from Ocado. I love the cute messages and these napkins wouldn't look out of place at grown up parties either. 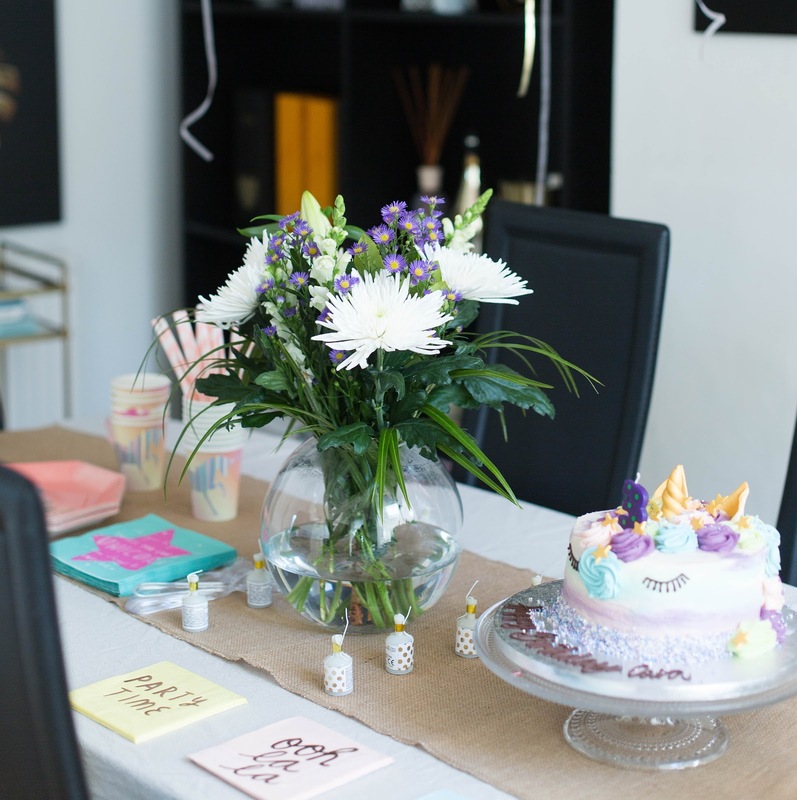 The pink ombre plates and the unicorn paper cups are from Hobby Craft. I'm so glad I went for the Pick & Mix option. Everything doesn't have to match. It's much nicer to have a bit of variety, don't you think? Although, I do think that the unicorn cups go incredibly well with the unicorn napkins I got from Sainsbury's (but it's not too matchy matchy, if you know what I mean). You cannot have a birthday party without some pretty balloons, but I wish I had bought more than I did. I totally forgot how big our dining room is and we could have done with three time as much balloons I had bought. I love these pretty marble balloons from Hobby Craft and I thought the purple ones looked particularly stunning. 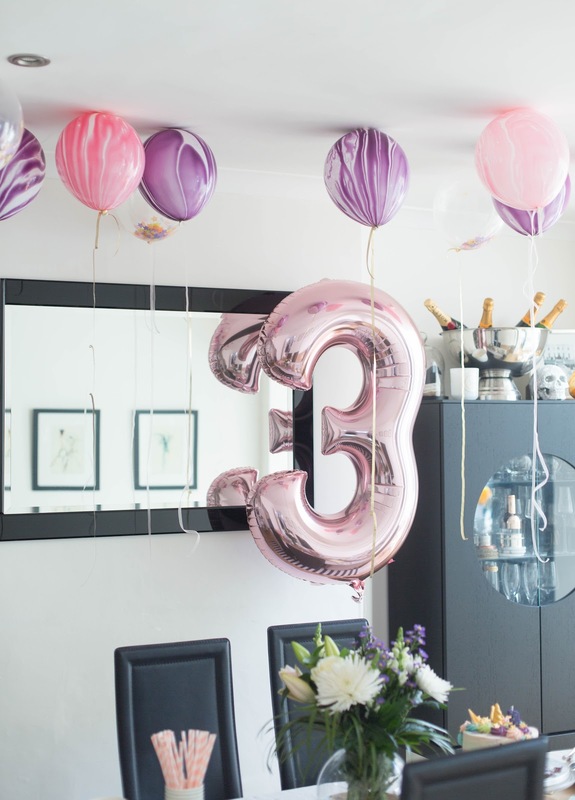 My number 3 rose gold balloon is also from Hobby Craft and it's the perfect size for this space. Always check the sizing when you buy those big number balloons. Luckily we had some helium left from our last party, so I didn't need to buy another canister for this one. Oh, I almost forgot. My pretty flower bouquet is from Sainsbury's (yes, I absolutely love supermarket flowers). Normally I go for a pink birthday party bouquet, but I thought this one suited the tablescape better. I knew that some of the cake decorations were going to be purple which is why the purple flowers in this bouquet won me over. 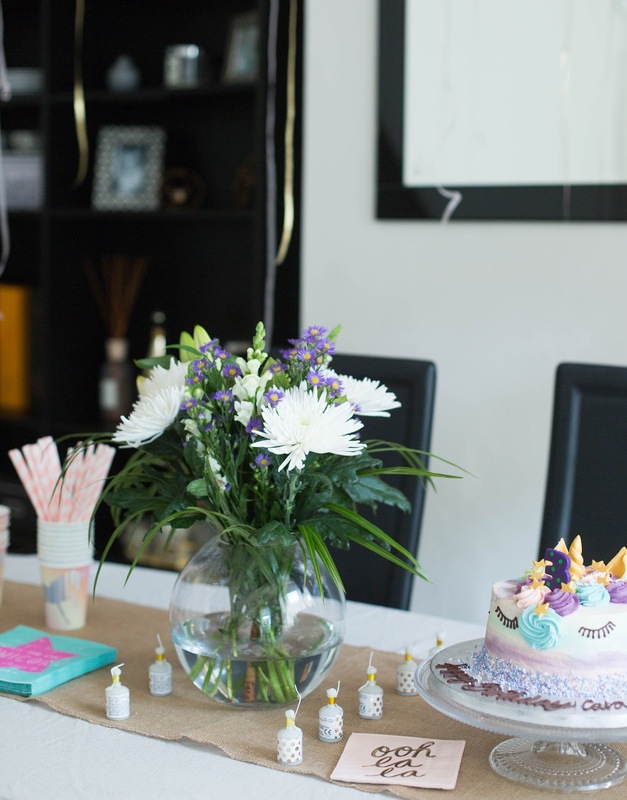 Birthday party planning is always a lot of fun, especially now that I feel like my girls really appreciate all the effort that goes into it. My eldest daughter will turn 6 soon and she has already told me what kind of balloons and decorations she'd like. I guess I better start planning now. Only few months to go! I'm Pia, a Finn-turned-Londoner. 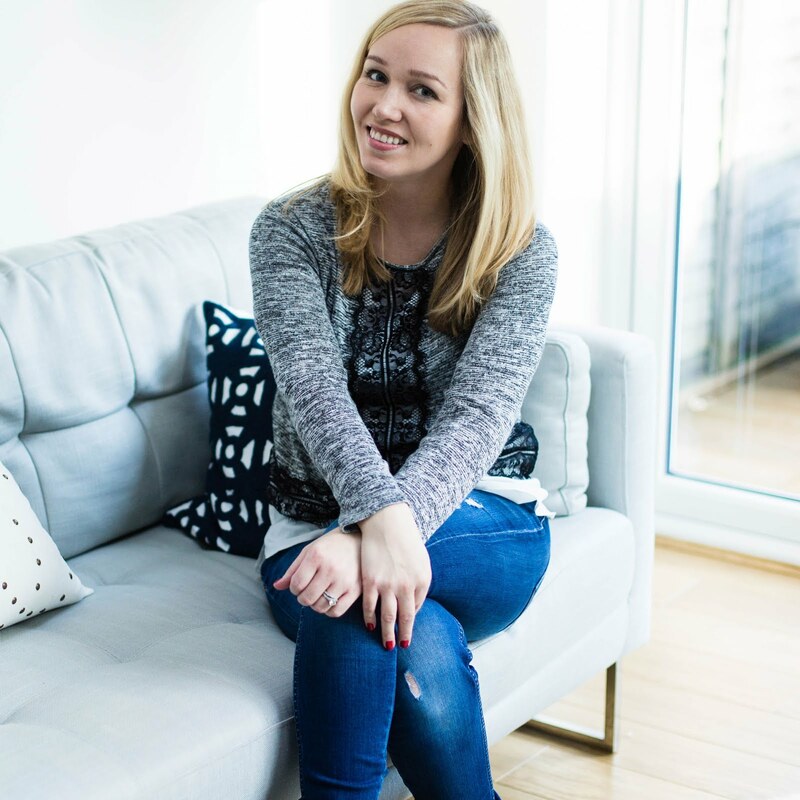 I cover everything from interiors to entertaining ideas on the blog. Hope you enjoy it! © FINNTERIOR DESIGNER | All rights reserved.